Homicidal is a 1961 American horror-thriller film produced and directed by William Castle, and starring Glenn Corbett, Patricia Breslin, Eugenie Leontovich, and Jean Arless. The film follows a murderous woman in a small California town whose presence unearths secrets concerning a prominent local family. As with many of Castle's films, the film was released with a promotional gimmick—in this case, a "fright break," that allowed patrons to receive a refund if they were too scared to stay for the climax of the film. A mysterious woman named Emily (Arless) convinces the bellboy (Richard Rust) at a local hotel in Ventura, California to meet her later that day at a local justice of the peace to get married, offering him a thousand dollars in compensation. Baffled by the request, he agrees. The two arrive at the justice of the peace's home late in the night, and pay him to marry them. Emily then savagely murders the justice of the peace during the ceremony, and flees. She later gloats to a mute, invalid elderly woman named Helga (for whom Emily is a nurse and works for a wealthy family) of her deed. The police investigate the crime and learn that the nurse was given the name of a local flower shop owner Miriam Webster (Breslin), who has an alibi of the night of the murder. It is revealed that Miriam and her brother Warren, who has recently returned from Denmark after the death of his last surviving parent, are heirs to Warren's father's estate. The two talk about how Warren's father was abusive to Warren growing up and the details of the will. Miriam stands to inherit the estate if Warren dies before marrying, as Warren's father was a misogynist who went out of his way to make Warren his sole heir so that only a male child of his could inherit. Miram also confesses to Warren good news of her own, that she is engaged to be married to her boyfriend. That evening, Emily breaks into Miriam's flower shop and wrecks the store. She is interrupted by Miriam's boyfriend, who comes to the store because he did not know that Miriam had left early that evening. Miriam and her boyfriend arrive at Warren's house the next day to visit Helga and confront Emily. Helga frantically tries to communicate with Miriam, who later finds out from Warren that Emily is actually his wife; he had hired her to take care of Helga and ultimately married her. Miriam later overhears Warren and Emily talking in the next room but does not see them together. Miriam's boyfriend learns of the murdered justice of the peace and that Emily resembles the suspect. Miriam ultimately goes to visit Warren and Emily, having realized that Emily is a murderer. She enters the house, and sees Helga descending the staircase on the stairlift. As she nears the bottom of the stairs, Miriam witnesses Helga's severed head fall off her body. She is then attacked by Emily; the two fight, and Emily removes her wig and prosthetic teeth, revealing herself to be Warren. Afterward, the police talk to Miriam as the truth about Warren is revealed: Warren was really a girl. The secret of the child's gender was known only to the child's mother, Helga the housekeeper, and the county clerk (who later became a justice of the peace), who had been bribed to enter the birth of a boy. This was done mainly to avoid the murderous wrath of Warren's father, who wanted a boy and would have harmed the child. "Emily" was an alternate identity Warren had created overseas to be able to live as a woman away from those who knew him. When Warren's father died and he learned of the clause in the will that would have denied him his inheritance if it was known he was a female, he resumed the alter ego of Emily in order to kill and silence those who would know the truth about him. After fifteen years directing a string of B movies for Columbia, Universal, and Monogram, William Castle mortgaged his house and formed William Castle Productions in 1958. His first release, Macabre, was a modest thriller. To draw attention to the film, he offered every audience member a $1,000 life insurance policy from Lloyd's of London against death by fright during the film. Castle promoted the film with TV commercials and previews that focused more on the life insurance policy than the film. The public bought it and the film was a financial, if not critical, success. William Castle added a gimmick to most of his films over the next ten years. This was the only film credit for enigmatic star Jean Arless. Many have assumed this was her only film. In truth, Jean Arless was actually actress Joan Marshall. She appeared in television and films from 1958 through 1969 using her real name. For her male role in Homicidal, Castle had Marshall's hair cut like a man's and dyed brown, had her wear brown contact lenses and had prosthetic appliances made to alter the shape of her nose, mouth and hands. William Castle simply went nuts. He came up with "Coward's Corner," a yellow cardboard booth, manned by a bewildered theater employee in the lobby. When the Fright Break was announced, and you found that you couldn't take it any more, you had to leave your seat and, in front of the entire audience, follow yellow footsteps up the aisle, bathed in a yellow light. Before you reached Coward's Corner, you crossed yellow lines with the stencilled message: "Cowards Keep Walking." You passed a nurse (in a yellow uniform? ... I wonder), who would offer a blood-pressure test. All the while a recording was blaring, "Watch the chicken! Watch him shiver in Coward's Corner!" As the audience howled, you had to go through one final indignity – at Coward's Corner you were forced to sign a yellow card stating, "I am a bona fide coward." Very, very few were masochistic enough to endure this. The one percent refund dribbled away to a zero percent, and I'm sure that in many cities a plant had to be paid to go through this torture. No wonder theater owners balked at booking a William Castle film. It was all just too complicated. Time magazine said: "It surpasses Psycho in structure, suspense and sheer nervous drive" and placed it on its list of top ten films of the year for 1962. Other critics were not so kind. Glenn Erickson from DVD Savant said it was "a perfectly wretched movie, bad enough to make Castle's other hits seem like flukes". ↑ Castle, William (1976). Step Right Up! I'm Gonna Scare the Pants Off America: Memoirs of a B-Movie Mogul. New York, Putnam. ISBN 0-88687-657-5 (Pharos edition 1992). Includes introduction by John Waters. 1 2 Waters, John (1983). Crackpot: The Obsessions of John Waters. New York, Macmillan Publishing Company. Chapter 2, "Whatever Happened to Showmanship? ", was originally published in American Film December 1983 in a slightly different form. ↑ "Time Listings: CINEMA". Time. September 16, 1961. Retrieved 26 January 2010. (subscription required (help)). ↑ Erickson, Glenn (March 28, 2002). 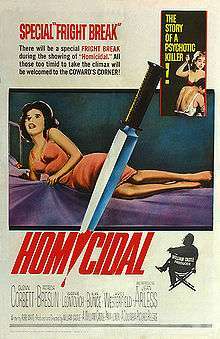 "DVD Savant Review: Homicidal". DVD Talk. Retrieved 26 January 2010.